The VA3PMO Repeater System comprises four repeaters, two UHF machines on 444.250MHz (FM) and 443.8125MHz (DV), and two 220MHz repeaters on 224.240 and 224.620MHz respectively. All four repeaters are coordinated by the Western New York Southern Ontario Repeater Council. All four are open repeaters available for all to use and develop operating and technical skills. NEW: 2010-03-11: VA3PMO FREE STAR* project is complete. The VA3PMO FREE STAR* repeater on 443.8125MHz and 2m half-duplex access point are both fully operational. These systems enable users with D Star radios to access the Experimental (XRF) reflectors and other D Star repeaters and reflectors using the D Star protocol (as published by the JARL). See the FREE STAR* page for further information. All repeater and computer hardware is privately owned and maintained by Ramesh, VA3UV. There is no club, no association, no BS, no politics, no secret handshake... so don't bother asking! The UHF FM repeater is the hub (or the nucleus) of a linking system. The system has been designed such that it consists of a 'Production' system, which is intended to be operational 24/7 (with the exception of any planned downtime for upgrades, hardware / software changes, etc.) and a 'Development' system, which will be used for ad-hoc experimentation, testing, development work. As such, the Development system will not always be available 24/7. Once items or components (either hardware or software) have been proven in Development, they will be cutover to the Production Environment.. I have done, and continue to do, an exhaustive amount of work to perfect the audio quality from the various VoIP / RoIP systems out there. My vision is to bring all of these different systems together into a 'hub' providing good audio quality, allowing a mix of systems enabling users to connect and converse with each other regardless of their individual technology platform, CODEC, geography, etc. Note, in order for your transmission to go out over the gateway, you need to set your radio into duplex mode with a 0 MHz offset. Being a half-duplex access point, please be sure to leave a pause between transmissions and listen out for other users that may be trying to get in. † IRLP Node 2651 is shared between VA3PMO (UHF) and VE3RSD (220); an outbound IRLP call can be made from either repeater. However, inbound IRLP calls will only terminate on VA3PMO (UHF). 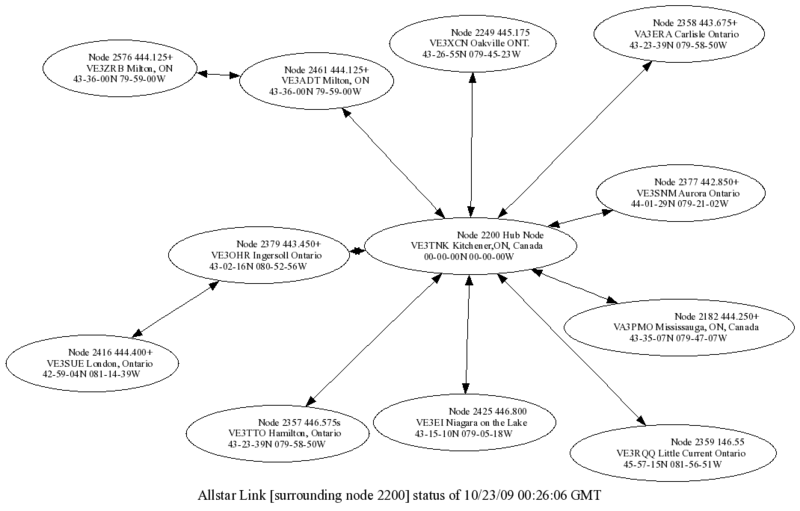 Module 'A' supports cross linking between D Star repeaters / DV Dongle users and Analog connections (e.g., Asterisk and IRLP connections). Modules B and C are used strictly for D Star linking (repeater to repeater / dongle to dongle, or dongle to repeater linking). Access to the D Star reflector is open to all authorized D Star users. D Star repeater owners / custodians are welcome to connect to XRF005 'A' on the understanding that module A supports analog connections.